Sekitori (wrestlers in the top two divisions) have a lot of accouterments. 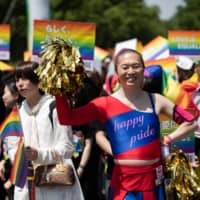 There are kesho-mawashi (ceremonial aprons), kimono, sandals, cushions and items like knee braces and tape that must be transported from the stables to the arena and brought on regional tours. 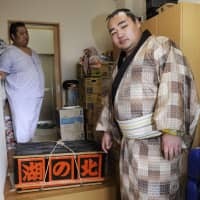 While athletes in team sports use heavy-duty team-issued bags, a sumo wrestler’s possessions are carried and stored in lacquered paper-and-bamboo boxes called akeni. In use since the Edo era, akeni are composed of a top and bottom section and are 80 cm long, 45 cm wide and 30 cm tall. The boxes, which weigh about 10 kg each, are also used by top-ranked gyoji (referees). 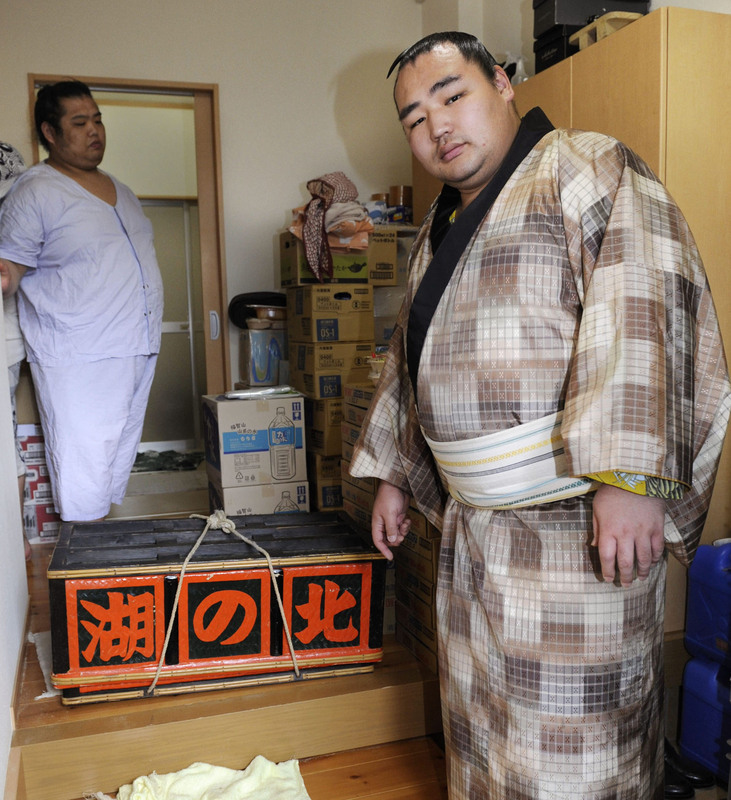 Yokozuna have more regalia and are allowed to use three boxes. All akeni share the same color scheme — green, vermilion and black. On the sides of an akeni are three squares containing the name of the owner in kanji. For wrestlers whose names consist of four or five characters, three are written large and the rest much smaller. For example Chiyonofuji (千代の富士) had the “no” (の) and “ji” (士) characters less than one tenth the size of the others. Akeni have no locks. The top section simply slides over the bottom one. When they are being transported via truck, a knotted rope is used to hold them together. Tatami-style mats are placed between akeni to protect them when they are stacked, but the nature of the materials involved means they show signs of wear and tear including cracking and splitting soon after being put into use. While regular akeni are expensive and only made for members of the Sumo Association, fans can buy plastic tissue boxes designed to look like akeni with the names of their favorite wrestlers on the sides.